In this chapter, the authors take the innovative approach of exploring the way complexity theory can help us understand resilience among young people. 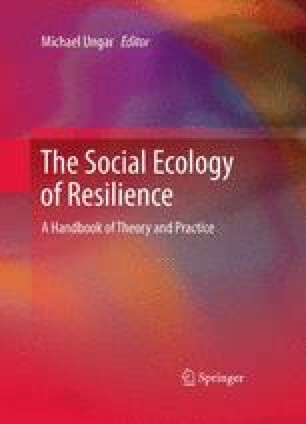 The chapter uses a case example to apply three aspects of complexity theory to practice, demonstrating how complexity theory is congruent with an ecological understanding of the supports (family and otherwise) that make resilience more likely. Belliveau, G., & Beare, D. (2007). Theatre for positive youth development: A model for collaborative play-creating. Applied Theatre Researcher, 7. Retrieved from http://www.griffith.edu.au/__data/assets/pdf_file/0008/52892/04-beare-belliveau-final.pdf. Accessed 21 Feb 2011. LaBoucane-Benson, P. (2005). A complex ecological framework of aboriginal family resilience. Paper presented at 30th anniversary conference first nations – first thoughts. Centre of Canadian Studies, University of Edinburgh, Scotland. Retrieved from http://www.cst.ed.ac.uk/2005conference/papers/LaBoucane-Benson_paper.pdf. Accessed 21 Feb 2011. Zimmerman, B., Lindgberg, C., & Plsek, P. (1998). Nine emerging and connected organisational leadership principles. Retrieved from http://www.plexus­institute.org/ideas/show_elibrary.cfm?id=151. Accessed 21 Feb 2011.